Abstract: Naturally, their mobile nature makes pulling out that 'special' drive a snap. For security reasons, for upgrade concerns, or to move a lot of files between a series of computers. Removable hard drive racks always seem to make the cheapest of cases look that much more important. Most of the hard drive racks we've seen in stores are rather shoddy, and when cooling a 7200RPM hard drive is concerned, fairly poor at best. So it was with some high expectations that we picked up this aluminum hard drive rack that came with an internal cooling fan. The KF-21 sells for about $45 CDN. You get the rack, and a pack of mounting screws. Yehaw! Instructions are not included. This particular drive rack cost about $45. Rather expensive as far as peripherals go, but it is made from extruded aluminum and even includes a fan at the very back, among some other rather cool features. But most importantly is that it appears to be rather well made. 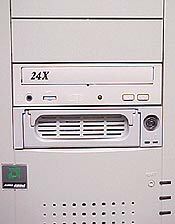 The unit is one you might find in a hosting company, or a high-end computer. Installing a drive into this rack is an easy affair. The drive caddy pulls out of the unit easily, and a small latch is the only thing which needs to be pushed down to remove the thin aluminum cover over where you place the IDE drive. The drive caddy itself is mostly aluminum, so it gives the unit a more rugged look than some of the less expensive plastic varieties we've reviewed before. A Molex connector and an 80-wire UDMA cable hook up to the hard drive which can be secured to the removable caddy with a few screws. With the drive installed, the aluminum cover is slid back on and all that remains is to install the docking station in an empty drive of your computer. Quite simple as hard drive installations go. The back of the KF-21 is like the back of a decent CD-Burner: IDE cable, connect, Molex power connector, and small cooling fan. Setting the drive to master or slave is done on the harddrive itself.